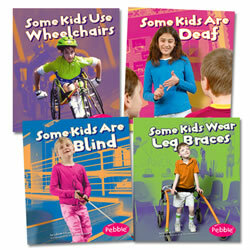 Promote the character development of children with Kaplan's selection of character education book sets, games, reference books, curricula, DVDs, CDs, and teaching kits. 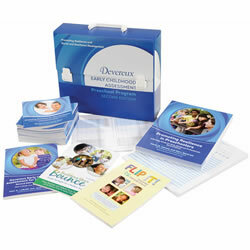 Our character building products promote discussions about honesty, respect, caring, and other good character traits that children need to develop in their social and emotional learning. Any of these products would also be great resources for teachers to use to address any character issues that may arise in the classroom. Birth - 6 years. 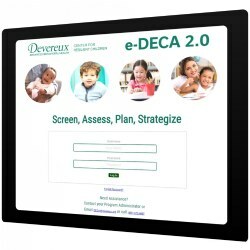 This web-based assessment solution administers the DECA for Infants, Toddlers, and Preschoolers online in English and Spanish. Completes all scoring and generates immediate access to reports, including individual ratings, rater comparisons, pre-post comparisons, parent letter, and group profiles. 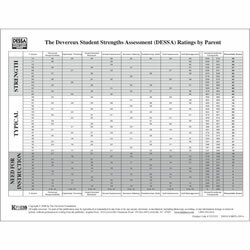 The e-DECA will require an annual license fee for e-DECA platform which is web-based computer version of the entire suite of Devereux' Center for Resilient Children Assessments, which includes access to the following ages 4 weeks - 8th grade. Grades K - 1. A wonderful way to teach diversity and tolerance to young children with full-colored photos of children with different disabilities enjoying activities with their peers. 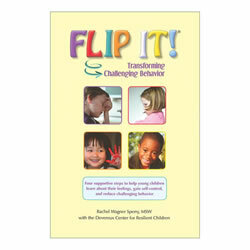 This resource outlines a four-step, supportive strategy to transform challenging behavior by helping children learn about their feelings and gain self-control. Paperback. 88 pages. 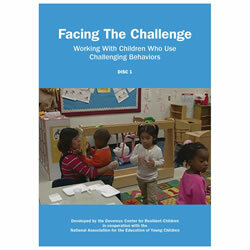 Disc One includes five episodes: What is Challenging Behavior?, Developmentally Appropriate Behavior, Why Do Kids Misbehave?, Parents as Partners and Skill Development Study #1. Disc Two includes five episodes: Prevention Strategies, Behavioral Planning I, Behavioral Planning II, Intervention Strategies, and Skill Development Study #2. 4 - 7 years. 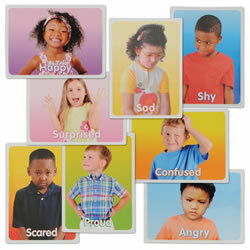 Explore the look and tone of emotions as kids match narrative statements to photographs of children's faces showing different expressions. To play, students listen to the sounds on the CD and place tokens on the images on their game cards that match what they hear. 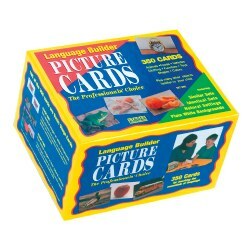 Each game set includes 12 game cards (5 1/2" x 8 1/2" each) with 8 photos per card, 120 game tokens, an audio CD, and directions in English, Spanish, and French. 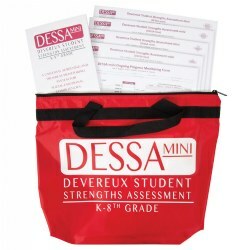 It also supports NCTM and NAEYC standards. 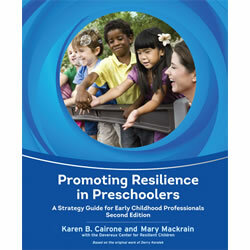 This resource offers early childhood professionals research-based strategies to enhance children's social and emotional health, as well as checklists and tips for improving the overall quality of programs. 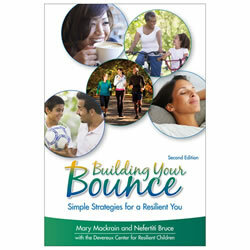 The collection of simple strategies helps adults build their own resilience. Full of reflection opportunities, it includes a survey that offers caregivers and parents a tool to monitor their personal social and emotional health. 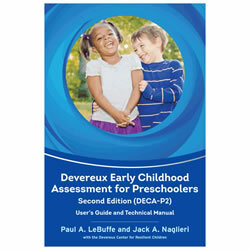 This guide provides early childhood professionals with the directions they need to use and interpret results of the DECA-P2. The manual also provides research information related to the development and standardization of the DECA-P2, including information about the instrument's reliability and validity. 4 years & up. A new twist on the long beloved game of dominoes. 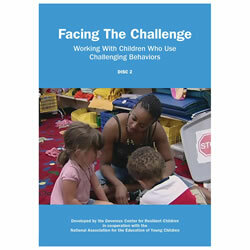 Learning games are a perfect tool for engaging children in the development of social skills. 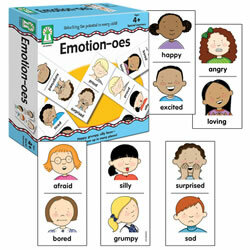 Includes 56 emotion-oes cards. 3 years & up. 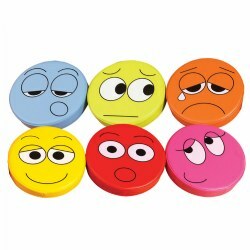 This set of eight magnetic children's faces range in emotions, allowing children to experience and identify with others. Measures 3 3/4" x 5". 3 years & up. Each brightly colored cushion is printed with facial expressions to encourage children to identify and express their emotions. Cushions are made of durable wipe clean vinyl. Set of 6 cushions. Measure 16" diameter. 2 years & up. 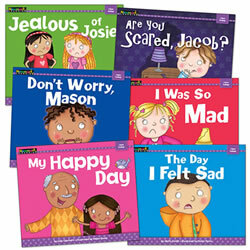 These 6 dramatic play characters express emotions that children will easily relate to. The interchangeable parts: hair, head, feet and bodies, 3 male and 3 female, allow for creation of new personalities and personal connection to the characters. 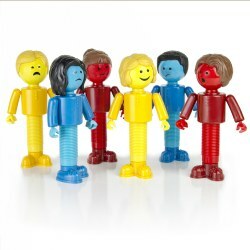 The 30-piece set includes 2 blue, 2 yellow, and 2 red ball and rod bodies with gender neutral shirts and shoes. Measures 3"W x 1 3/4"D x 7"H.
3 years & up. 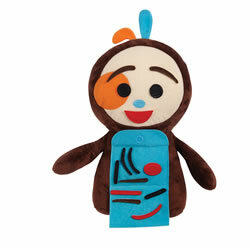 This cuddly pal will help children identify and feel comfortable with their emotions. 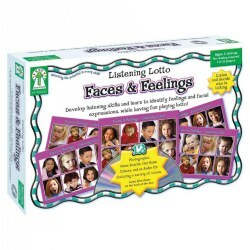 Feelings Friend has an assortment of facial features in its front pouch and includes illustrated emotion cards, conversation starters, and a social-emotional development guide. Measures 12" high. 3 years & up. 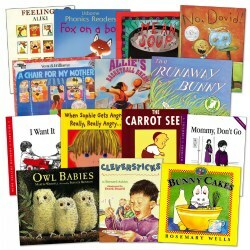 Help children build social and emotional intelligence through shared reading and engaging texts that prompt discussions about real-world experiences. 1 full-color poster included. Set of 6 paperback books.